In his Preface to the Historical Dictionary of American Cinema, M. Keith Booker notes that American cinema has “become the world’s most important cinema and one of the most powerful forces in world culture”, adding that given its long history, “no single volume can be comprehensive in its coverage of the more than a century that now constitutes the history of American cinema.” Booker goes on to write that his dictionary is a modest attempt to capture the “complexity and diversity” of both the film industry, and American films themselves. Unfortunately for serious researchers looking for an authoritative reference in the discipline, Booker is spot on. His Historical Dictionary not only fails to capture this diversity and complexity, but it barely qualifies as an adequate reference resource, even given the decision to create a dictionary rather than an encyclopedia. Despite the fact that the former is traditionally much more narrow in its treatments and much less comprehensive in the nature of its entries, standards nonetheless must be met to ensure quality. While it would be easy to dismiss the text‘s lack of breadth and depth to the limitations of both the dictionary form and the series parameters, given the hardcover purchase price of $85.00, it would be remiss to not hold Booker’s dictionary up to the stringent standards that determine the quality and value of an excellent reference book. Certainly, it passes the test of accessibility, or ease of use, and considering that the author is the James and Ellen Wedley Roper Professor of English at the University of Arkansas, arguably the text passes the litmus test of authoritativeness. However, when it comes to the yardstick of comprehensiveness – which is to say that any good reference work should contain entries covering every aspect of a subject which could reasonably be considered important or crucial, this text does not. In other words, a careful reviewer should be able to understand the reasoning behind inclusion, and exclusion, of entries. This presents a problem with the Historical Dictionary of American Cinema, as Booker inexplicably excludes benchmark actors such as Brad Pitt, John Goodman, Kirsten Dunst, Reese Witherspoon, Nicholas Cage, Jake Gyllenhall, and Kevin Spacey. Although he includes an entry for comedy (and entries for Laurel and Hardy, as well as the Marx Brothers), he omits the comedy teams of Cheech and Chong, and Dean Martin and Jerry Lewis. While it might seem that the preference here is for ‘classic’ stars and films, other actors illogically omitted include Frank Sinatra, Sammy Davis, and Jack Palance. Extremely important composers like Jerry Goldsmith are also mysteriously overlooked, as are cinematic terms such as soundtrack, and landmark films like Dracula (1931). In the editor’s forward, series editor Jon Woronoff writes that the text “is certainly a crucial volume that has to fill a very big gap” in film scholarship, arguing that its dictionary section is “large and densely packed with information [and] looks into many of the essential details with hundreds of entries on the main actors, directors, producers, scriptwriters, composers, and others who contribute to the making of a film”. However, it is impossible to find any proof of this claim; sadly, the dictionary section of the Historical Dictionary of American Cinema cannot in all honesty make this claim. The Civil War epic Gone with the Wind will go on to gross over $190 million, at that time easily the most in history. When adjusted for inflation, it is still the top box-office draw of all time in 2010. The Wizard of Oz is less of a hit when first released but will go on to become one of the iconic works of American popular culture. John Ford’s Stagecoach is a landmark in the evolution of the Western genre. Films such as Nincotchka, Mr. Smith Goes to Washington, and Wuthering Heights are also released, making this arguably the greatest year in American film history. Booker similarly gives researchers necessary relational context when chronicling the evolution of specific film studios, cinematic techniques, and awards. In fact, for the beginning film student, his ‘Chronology’ may be one of the most valuable resources available. This same information is also presented in narrative form in Booker’s ten page ‘Introduction’, thus allowing the film student even more insight into the relationships between people, studios, films, movements, and events. Without a doubt, the most valuable sections of Booker’s dictionary are these prefatory materials, as they offer more than a just the factoids view of a cultural phenomenon. Booker also creates an invaluable resource in his ‘Bibliography’, which is extensive and accessible. He breaks the citations into various categories for user friendliness: General Studies, Specific Historical Periods, Genres and Modes (Blaxploitation, Children’s, Comedies, Cult, Documentaries, Fantasy, Film Noir, Gangster, Horror, Independent, Musicals, Postmodern, Science Fiction, Sports, Spy, Superhero, War, and Westerns), Thematic Studies (The Blacklist, Feminism, Gender Studies, Politics, and History), Individual Films, Personnel, and Reference. Although none of these categories are exhaustive or comprehensive, as a whole the ‘Bibliography’ can serve as a useful tool for film studies, at both the undergraduate and graduate levels. 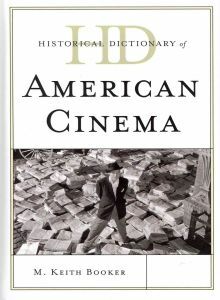 While it is difficult to recommend the Historical Dictionary of American Cinema because of its weaknesses as a dictionary, arguably the prefatory and closing sections of the text will give researchers (and librarians) cause to reconsider. As is the case with most hardcover works of reference, the price approaches being prohibitory, leaving would-be purchasers with the question of whether a ‘Chronology’, ‘Introduction’, and ‘Bibliography’ are worth $85.00. Fortunately, the text is also available as an e-book, which may make the price to value ratio more palatable.